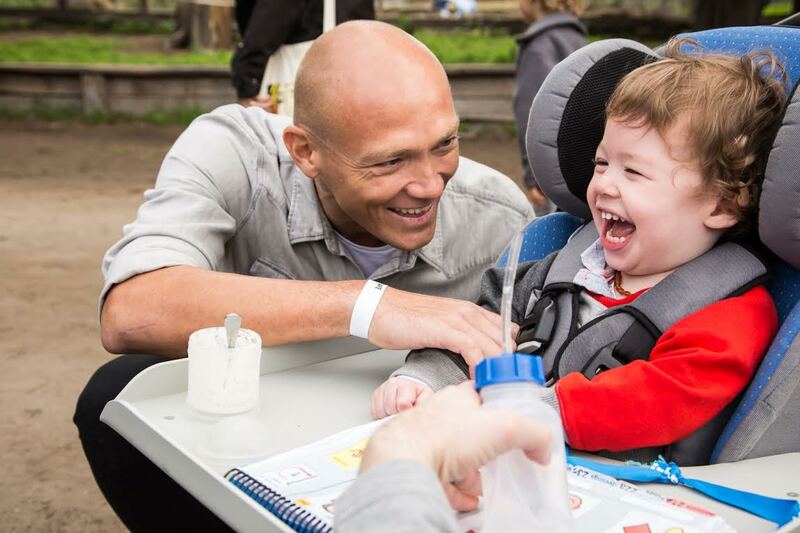 Former Olympic champion, Michael Klim, has spent the last decade helping the families of children with neurological conditions through his support of Not for Profit Brainwave. Klim is this week’s Changemaker. Throughout June, Klim and his wife Lindy will be donating some of the profits from the sale of their Milk & Co skincare products to Brainwave. The money raised will help fund programs including mobility and rehabilitation and ongoing therapies and family events which provide emotional support and promote social inclusion. Brainwave is Australia’s only charity supporting the families of children with neurological conditions including cerebral palsy, epilepsy, tumours and acquired brain injuries. In this week’s Changemaker column Klim explains why he is passionate about helping families in need. Throughout June Milk & Co, the skincare company I started with my wife Lindy (a Brainwave Ambassador) is donating $1 from every 375ml bottle of Milk Baby Bath Time Wash and Milk Baby Shampoozle & Conditioner sold at Coles and Woolworths stores nationally to Brainwave Australia. All money raised will help Brainwave fund mobility and rehabilitation equipment, ongoing therapies, and free family events that give families under pressure some much-needed emotional and social support. I first became aware of Brainwave’s work when my friend Professor Andrew Kornberg asked me to come in to the Royal Children’s Hospital and meet some kids on the Paediatric Neurology Ward. I felt a real affinity with the children. I guess the rest is history. I’ve been working with Brainwave for more than 10 years now, attending family days, visiting kids during their hospital stays, making community service announcements, and spreading the word about Brainwave’s work through my social networks. What do you like best about working with Brainwave? Even before having children I always felt a strong affiliation with the kids I met. No matter what, they always had a smile on their faces. After spending time with Brainwave kids and their families, who are dealing with the day-today realities of all kinds of brain conditions and illnesses, it would make me see that many of the things I was facing really weren’t that bad. Now that I have three children of my own I realise how lucky I am that they are all healthy, and it makes me want to do even more for Brainwave. Being involved with Brainwave is definitely a two-sided thing for me. Not only do I love to meet and spend time with the children, some of whom are living with some really horrible illnesses, I also love to help on the fundraising side of things. Many of these children will require numerous operations and expensive equipment, so anything we can do to help is, of course, really important to Lindy and I. For me right now it’s probably maintaining work-life balance. We’re starting to lead such crazy busy lives – as individuals and professionals and fathers it can be quite tricky to balance all the competing demands on our time. That’s another reason Brainwave is so attractive to me – it puts things into perspective. Family’s at the centre of everything. It’s the most important thing there is. School actually gave me my first lesson in resourcefulness. I travelled a lot in my final years of school, between Wesley in Melbourne and the AIS in Canberra, juggling study, exams and swimming. So I learned to juggle responsibilities and to prioritise, which has proved useful in recent years as we divide our time between Melbourne, where our business is based, and Bali, where Lindy’s from. I did the International Baccalaureate at secondary school, and that gave me a really well-round education. Given that I went on to a swimming career rather than uni it was a really great starting point. I don’t know if there’s one person I can put a finger on. When I was growing up it was athletes like Boris Becker, Michael Jordan. Now all kinds of people inspire me, from world leaders to successful entrepreneurs like Richard Branson. I guess the qualities I’m inspired by are fine values, innovation and a sense of purpose – people who, once they believe in something, make it happen. Many of us just talk about things sitting around on the couch or at dinner parties. Inspirational people get up and make it happen. I think we’re already achieving the dream when we assist families on a small scale to make their lives as liveable as possible. Every case is different, so we have to respond on a case-by-case basis. We can’t prevent trauma injuries or brain illness. What we can do is make life easier for patients and families by giving them the practical help they need. It’s also my dream for my kids to witness the work Brainwave does, and to pass that work on to them. They came to a Brainwave event just recently. It’s great for them to know how lucky they are, and how much Brainwave’s work means to the families involved.